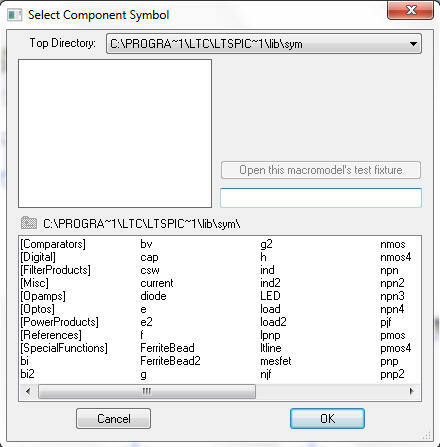 So we have learned how to enter a schematic in LTspice®. This LTspice tutorial will explain how to modify the circuit and apply some different signals to it. Note the voltage source is missing. To test the frequency response of the filter we could apply a sinewave input to the circuit and measure the amplitude of the output, then change the frequency of the sinewave and repeat the process. Or we could apply an ac sweep to the input and get a plot in the frequency domain instead of the time domain. Scroll to the far right and add a 'voltage' and place it in the circuit. 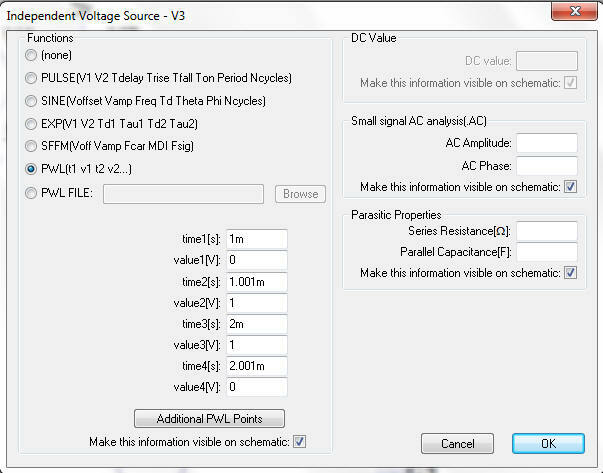 Keeping the Function selections as 'None' enter a voltage in the Small Signal AC analysis box. 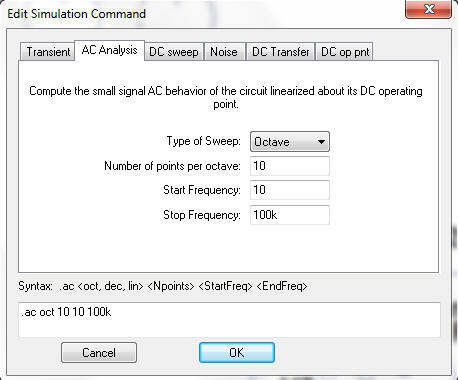 Enter an amplitude of 1V then click OK.
We now need to configure the simulator to perform the ac sweep. Clicking on the running man symbol will run the simulation. Probing the OUT node will plot the frequency response of the filter, clearly showing roll of above 1kHz. The phase response of the output with respect to the ac signal source is also plotted on the right hand y-axis. If we want to magnify a certain area of the plot, move the crosshairs to the desired part of the plot, left click the mouse and, holding it down, drag it over the area to be magnified. The plot will then zoom into that area. The coordinates of the crosshairs are shown in the bottom left hand corner of the screen and when a box is selected, these coordinates show the differential values of the box. Since this example is plotted in the frequency domain, the x-axis displays frequency. If the x-axis shows the time domain, the coordinates show time and when a box is selected the coordinates show differential time and frequency. Hitting the <F9> key undoes this action. If you want to zoom in or out when in the schematic window, use the Zoom In and Zoom Out symbols on the menu bar. Alternatively the jog wheel on your mouse performs the same function. Holding down the left mouse button and moving it over the schematic allows you to pan over the circuit. Hitting the space bar auto-sizes the schematic window. The x-axis and y-axis settings can be changed by moving the crosshairs over the desired axis and left clicking the mouse. To check the roll off characteristics of the filter, we need to display the cursors. Move the mouse to the 'Vout' logo at the top of the plot pane and right click. This brings up a menu to enable us to select between 1 cursor or 2. Selecting a single cursor results in FIG 6. (the shortcut for displaying the single cursor is to left click on the waveform icon V(out)). To select 2 cursors, double click on the Vout icon. Moving the crosshairs over the cursor and left clicking the mouse enables us to move the cursor and measure the magnitude and phase response of the circuit in the results box. Closing the results box removes the cursors. 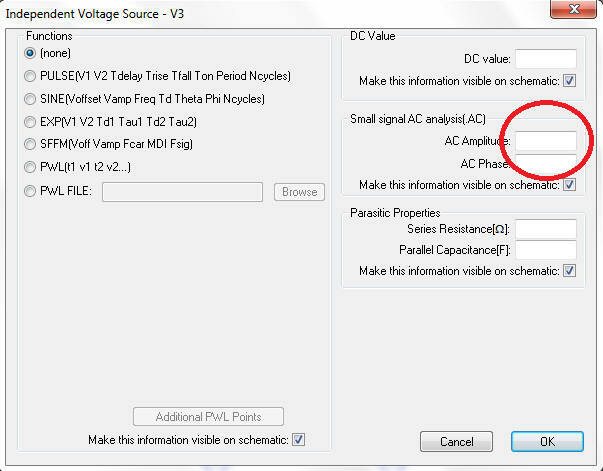 If 2 cursors are selected differential voltages and phases can be displayed. We are now going to change the input signal from an ac sweep to a piecewise linear waveform. A piecewise linear voltage source consists of a series of voltages specified at certain instances in time with a linear change in voltage between them. Right click over the input voltage source to bring up the parameters dialogue box. Delete the ac amplitude and change the function button from (none) to PWL (piecewise linear). The waveform above starts at 0V, stays at 0V until 1m after which it rises to 1V in 0.001ms. It stays at 1V until 2ms, then falls to 0V in 0.001ms. In the schematic editors, click on Simulate -> Edit Simulation cmd and click on the Transient tab. Set the transient analysis to have a stop time of 5ms and click OK.
Probing the IN and OUT nodes shows that although the Butterworth filter has excellent pass band performance, it is a poor filter to use if trying to maintain the shape of a pulse. A word of warning: If the PWL input starts at a non zero voltage, the Y axis of the plot pane will start at a non zero voltage.